Ok, finally! 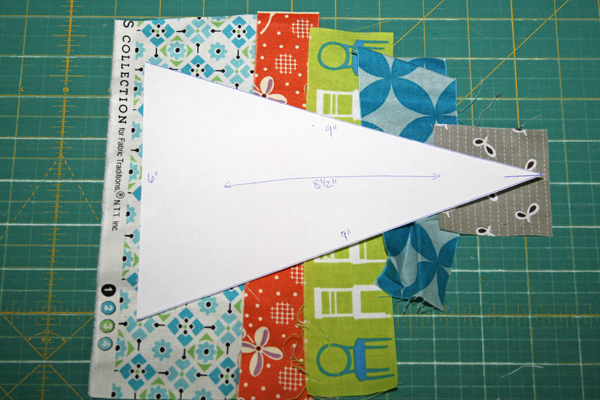 Look what I have for you… a quick little tutorial on how to construct the scrappy triangle blocks I used in my Nautical quilt. 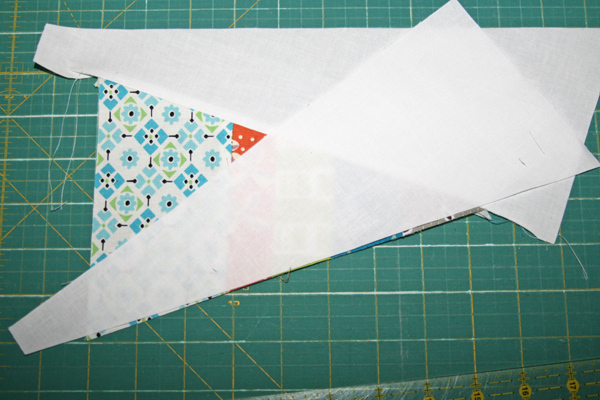 A few things before we start… this tutorial will show you my method for making a scrappy triangle block. I’m not providing fabric requirements, or instructions for fully completing this quilt, because well, I just don’t have time! 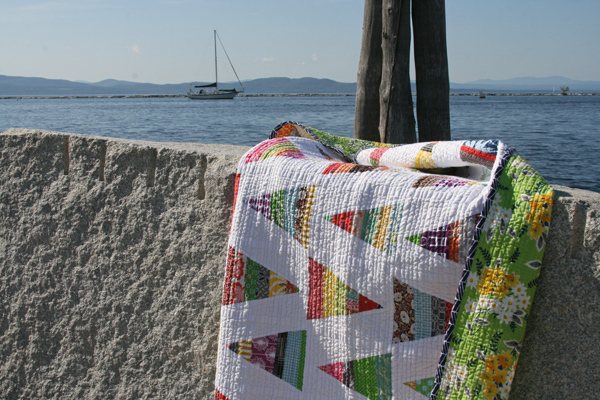 and because I think there are many great tutorials already out there for finishing quilts. If you have questions about the block, leave them in the comments and I’ll answer them there. Feel free to use and share this tutorial, but please remember to give credit! Block size: 6 1/2″ x 9″. 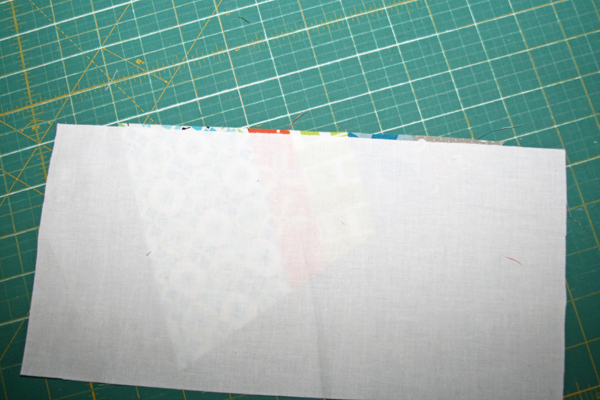 Once you have your template cut out, you can start sewing together your scraps. I sewed most of mine together the following way because I think it results in less waste. I find that 5-6 strips seem to work best for this size of triangle. You could use more if you wanted, but you should make sure that your first and last strips are wide enough so that you don’t lose the fabric in your seam allowance. 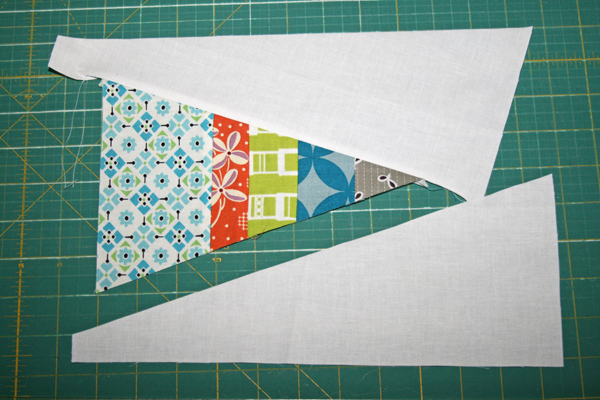 Lay out your strips, overlapping them a bit to account for the seam allowance, to make a basic triangular shape. Lay your template on top to make sure the scrap area is large enough. 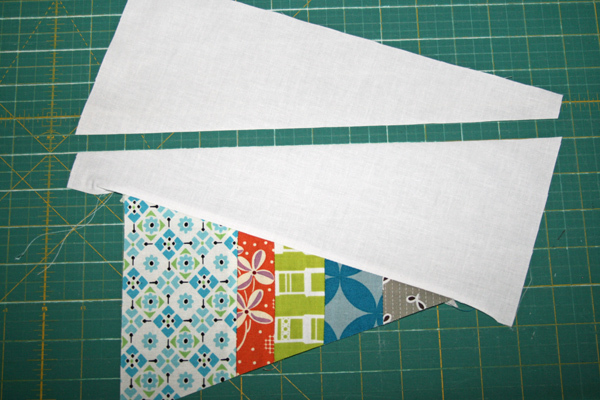 Sew your strips together using a 1/4″ seam allowance and iron. I iron my seams open, but feel free to use your preferred method! Trim, using your template as a guide. 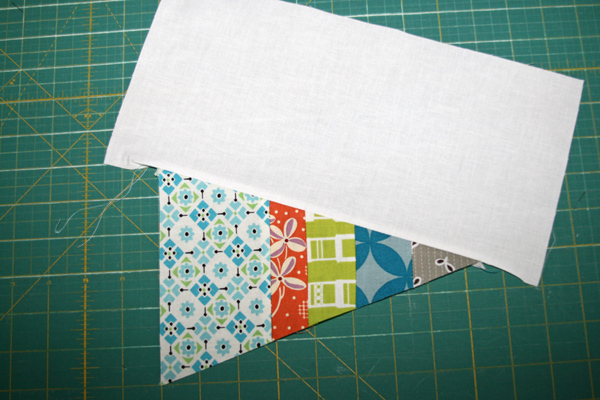 Cut a piece of your background fabric that measures approximately 6″ x 12″. 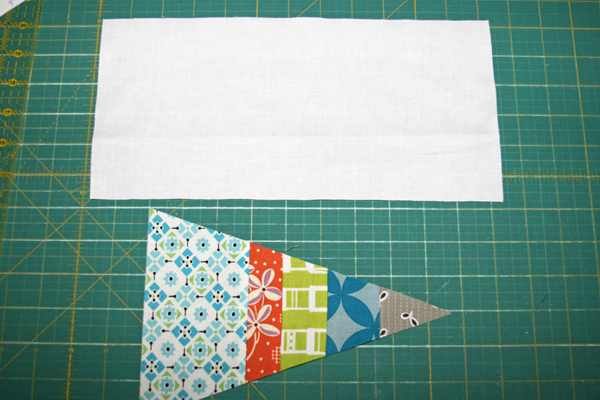 Align the long side of the background fabric with one of the long sides of the triangle. 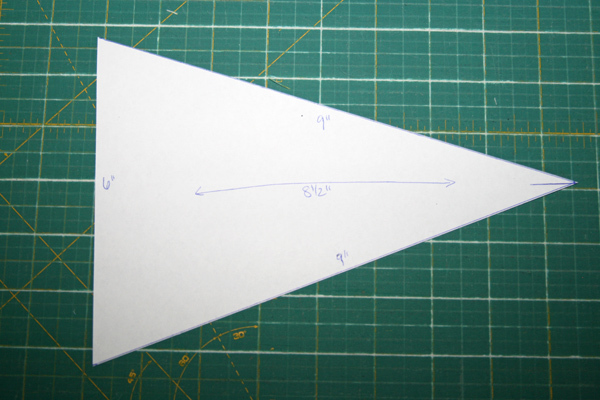 You’ll want to align it so that there is about 1.5″ of background fabric on either end of the long side of the triangle. Sew along that edge and press. It’ll look something like this. 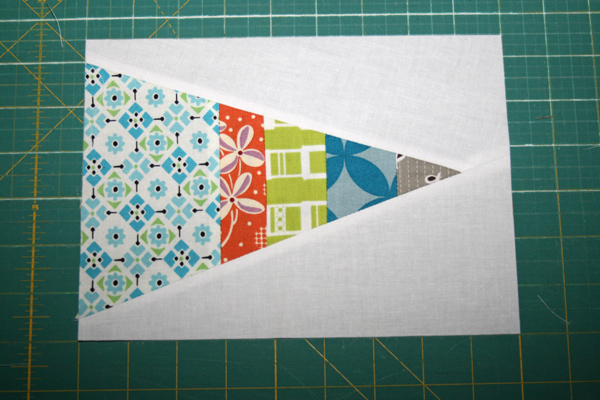 Align the short edge of the triangle with one of the vertical lines on your cutting mat and then make a horizontal cut through your background fabric approximately 1.25″ above the top of the short edge, as shown above (this doesn’t need to be exact, as we’ll be trimming it down later on). You’ll have something that looks like this. Take the background piece you just cut off and flip it around like so. Flip it up so the right sides are together and sew along this long edge, again leaving about 1.5″ of the background fabric on either end of the triangle. Press this seam. You’ll have something that looks like this. Trim the top and bottom sides so the height measures 6.5″. 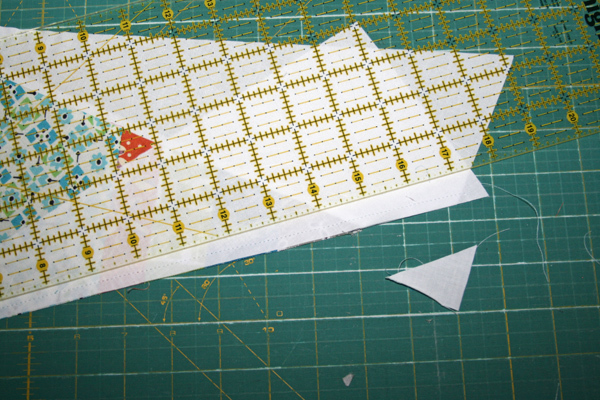 I aim for about 1/2″ of background fabric above and below the short edge of the scrappy triangle. Trim the sides so the block measures 9″ in length. And ta da! One scrappy triangle block! 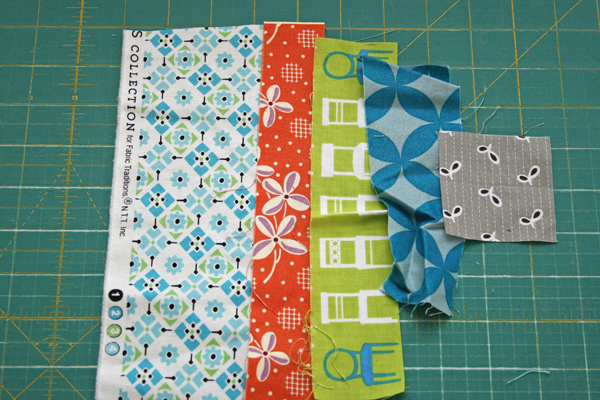 Make a whole bunch more, arrange them how you’d like, and sew them together into a lovely quilt top! As always, if you make any, I’d love to see them, so be sure to add them to the FITF Flickr group! This entry was posted in Posts about Quilts, Tutorials and tagged fabric scraps, handmade, quilt, quilt block, scrappy triangle, tutorial. Bookmark the permalink. another 10!!! love it. love the scrapiliciousness. thank you for sharing another winner, must do. Absolutely perfect tutorial! I can see it with many different sizes of triangles as well. Thank you. . .and keep creating! I have 2 little babies and I can’t even imagine having the time to do them like you do! BUT I do have to say that this one is AWESOME I totally love it! I love the back fabric! Its on my to-do list… but the question is, will it ever get done? LOL. Great tutorial! Thanks so much for sharing your technique – a new way to use up strippy, scrappy stuff!! I really love the look of this quilt. Thanks so much for taking the time to do this tutorial. Thank you! I really appreciate your tute – lovely quilt! thanks so much for the tutorial, I’ve got so many scraps and this will take care of them all. thanks for this! I love this quilt and hope to make one someday! I was so hoping you would share how you did this. I love this! 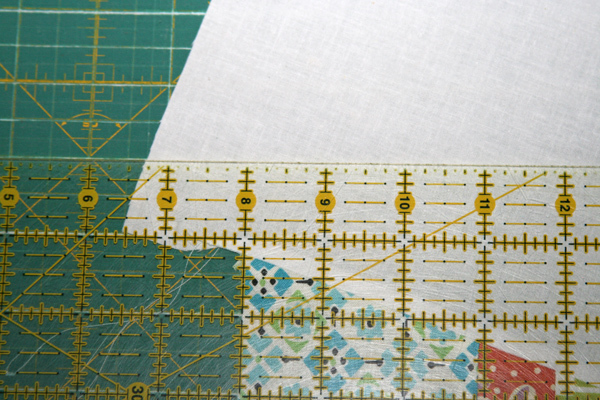 I’m finishing up a Rectangle Squared quilt right now. This may have to be the next one I start. Thank you for being so generous and sharing these tutorials! Thank you so much for sharing this! I have pinned it and it’s one I’ll be visiting again and actually attempting! We have plans to get our son into summer sailing school in a few years (he’s just two now), and this would be an amazing gift for when he completes his lessons! thanks it’s a gorgeous quilt! Oh – this is great. As late as this morning I posted in my WIP update that this was a quilt I want to make. And ta-da… here’s the tutorial. Fantastic! Thank you so much for taking your time to do this. It’s a stunning quilt. You’re the best. I wasn’t sure if this was foundation pieced or not but I love that it’s not. Thank you for taking the time to put this together. I love this quilt…thanks for the tutorial! I think this is my all-time favorite quilt you’ve ever done (so far!) and I’m so glad you shared your method. Done just as you did yours, or used as a jumping off point – this block is really inspiring to me! The nautical quilt photos themselves were lovely to – great location and who could resist the handsome max inspecting the quilting! Thank you for sharing! Thanks you – adore the quilt – so fresh and looks achievable – again, many thanks! I loved this quilt you did recently, thanks so much for creating a tutorial! Thanks for another opportunity to use up scraps. Hopefully this will make a big dent in four bins of them! Thanks so much! Love this quilt! Love this quilt & thanks for the tutorial! Just wanted to say that all of your quilts are absolutely gorgeous! LOVE the quilt! Great tutorial. Another way to use my mountain of scraps. i love that you’re careful to use all the scraps and not make any more! this is def. on my to-do list! Thank you Thank you. Have been patiently waiting and enjoying the baby pics. Know ur bsy. Can’t wait to get started. I love your work!! I am opening a B&B and I just emailed you about possibly teaching a workshop at my new inn next summer. I hope you are interested!! Thanks so much for taking the time out of your busy day to do a tutorial for those of us that just LOVE your quilts, style and techniques. I have plenty of scraps and will be busting them out after the holidays to make this one for myself! Thank you Ashley, you rock! Such a great quilt design. Thanks again Ashley your work is always an inspiration. Thank you so much!! Looking forward to making this quilt. I love this quilt! Thanks so much for the tutorial, I’m going to make one right now. Thanks for sharing! Maybe this will finally inspire me to start working on a nautical themed quilt I’ve been dreaming up for awhile now. Thanks for a great tutorial. Just last week-end my niece asked me to make her a quilt. I think I might have found the pattern! I’ve gotta find the time to make some of these. So scrappy goodness. That’s how I make my triangles too, so simple. I LOVE this!!! And I especially love how you do NOT worry about perfect sized pieces (ie, cutting the white part) as a ‘pattern’ would have you do — when things get too fussy, it takes the fun out of it. But this definitely looks like a FUN must do project!! Love this. Thanks for sharing. This is definitely going in my to do stack. I have several scraps that I think would be great in this. When I post it on my blog, I will definitely be giving you all the credit. I am not a block designer…thank you. Wonderful tutorial, this quilt is so awesom, so colourful, I love it!!!! fabulous quilt! love these triangles. Thanks for the tute! I am home on a day off from work and saw this and started one asap. I am really liking the use of my scraps. I thank you for taking the time from your busy day for other quilters. We are people who love getting the most from every scrap of fabric. I’ve been wanting to make a quilt with triangles, and I love the scrappy version of this one! May I use this for block tutorial at one of our MQG meetings? I would, of course, credit you and your blog. Now that is a great tutorial! I might just have to try this one out myself! Just found this tutorial. Fun quilt!!!! Oh, great quilt and tutorial! I have scraps that would be great for this! Thanks for posting! I found you via Pinterest and now I am a follower! I LOVE this quilt. 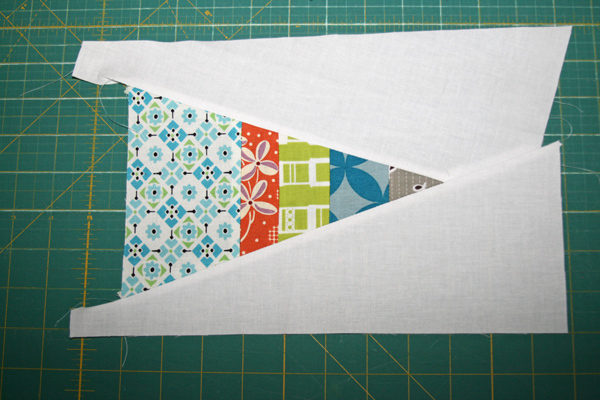 Now i need to go out and make 3 quilts to have enough scrappy-ness to make this! Thank you! I would die and go to heaven if you ever decide to save your trimmings from the trash, then sell them to me. I am going to make this quilt. You are so inspiring. I saw your other version ‘low volume’ as well…so pretty! 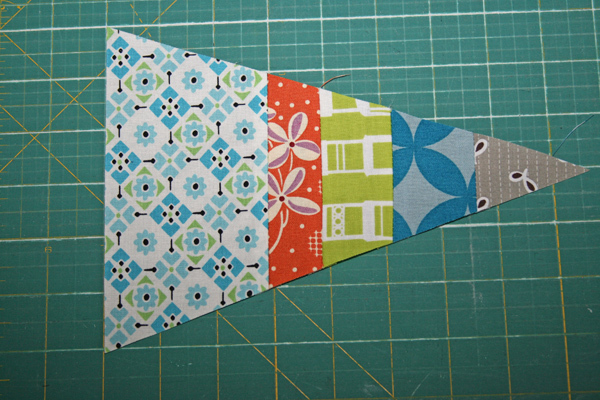 I am scanning through the blog world for a triangle tute because I have an idea for a swap and there you are on Crafy Foxes.. I love bumping into you… but its so funny, can I use this tute in a swap??????????????????? Pingback: Finally finished this triangle trail marker quilt! Loving the low volume background fabrics! Thankyou so much to Ashley of Film In The Fridge for publishing such a great tutorial! Love the quilt. Love the colors. Thank you for sharing. I just finish this quilt this is beautiful. My question is . For the quilting how far apart the quilting strip are? Thank you so much for the wonderful Triangle tutorial. I am lucky to go through the same. I love the quilt and am trying to make one like it. I made one block using your great tutorial and then realized that the 6 x 9 triangle is quite a bit smaller than the one you must have used for your quilt. 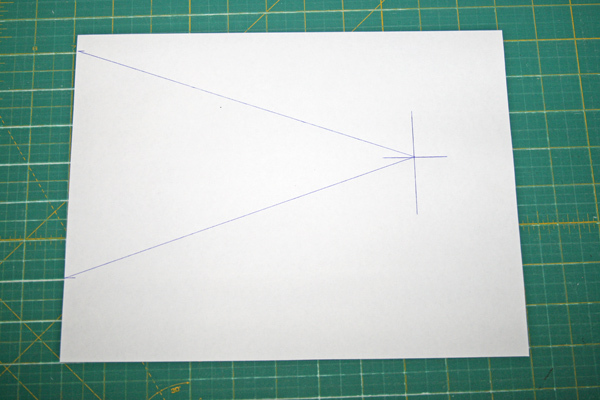 Approximately, what size was your triangle template — 10″ x 15″? What size was your finished quilt? I made this for my Grandsons room. It turned amazing. Thank you for such easy to follow directions! I loved this design for a nursery. The mom picked the colors she is using in the nursery and I went to work…used a little duckies print, with nursery colors for the backing…very sweet! Thanks. I finally finished mine. Your design was an inspiration. Modified it a bit, mine is less scrappy but very dotty! I added a scrappy border. Great quilt, can’t wait to get time to make this one. Thank you. I love this quilt! And the tutorial is easy enough for me! Yeah! Thank you so much for posting it. Out of curiosity, what batting did you use for this quilt? I ❤️ the texture to it!! Thanks!